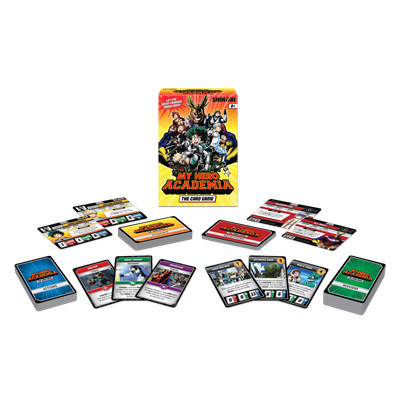 A thrilling card game set in the super-powered world of the hit anime My Hero Academia! In My Hero Academia: The Card Game, you must recruit super-powered Students to your Hero Agency. Select Students with the best combinations of Quirks, (super-powered abilities) to complete challenging Missions and become the mightiest Agency around! Your goal is to become the most popular Superhero Agency in the world. Agencies gain popularity by completing Missions and recruiting the best Student Heroes for the job, so recruit wisely! Each Student has varying points for Strength, Speed, and Intelligence. Some Students have a special Assignment that help your Agency towards completing a Mission!